When I first heard it I was in the studio with Paul Daley. I'd heard it before, growing up, and it was something that seemed to be around. It's a difficult concept for young people to understand that a record came and went - it disappeared, a record like that. It was a single, so it was on the radio, but once it was gone, there was nowhere else to get it; it disappeared into the sands of time and then ten years later you might hear it. I think I heard it in a club as well, but I remember sitting in the studio, or in Paul's house, and he played it late at night and suddenly we both just got it, hearing the whole thing from beginning to end. It would have been the early '90s when it reemerged back into my life. This whole record for me is 'Why Can't We Live Together', the first track, and in my head it's probably one of the most extraordinary pieces of music ever recorded. 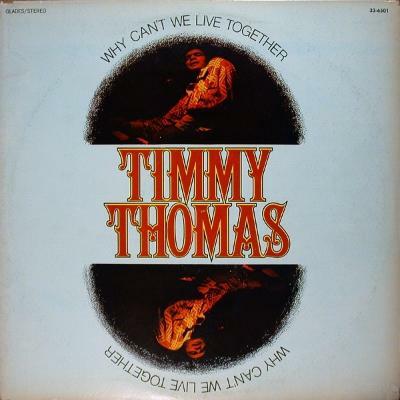 It's all done in one take with a drum machine and Timmy Thomas just singing this epic soul track. It's minimal and it's raw. That's been a big influence on me. It's a one-track album and it's such an epic, brilliant piece of music that people should see - you can see him recording it on YouTube, it's done live. You can hear him turning the drum machine on - it's a Roland drum machine, which I sought out as a result of hearing this record. It's a primitive drum machine and incredible soul voice and keyboard, and a great song.